Photo of the Week. The Small Magellanic Cloud, a nearby satellite galaxy 200,000 light years away, seems to float between the deep southern constellations Tucana (the Toucan) and Octans (the Octant). 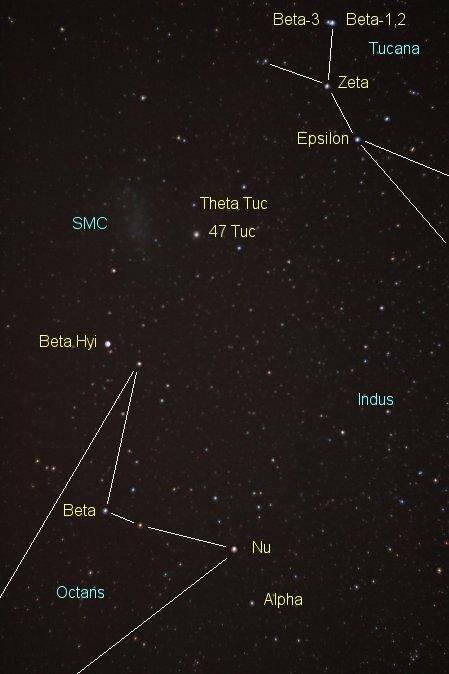 47 Tucanae, 17,000 light years away, is one of the greatest globular clustersin the Galaxy. Astronomy news for the week starting Friday, August 27, 2010. 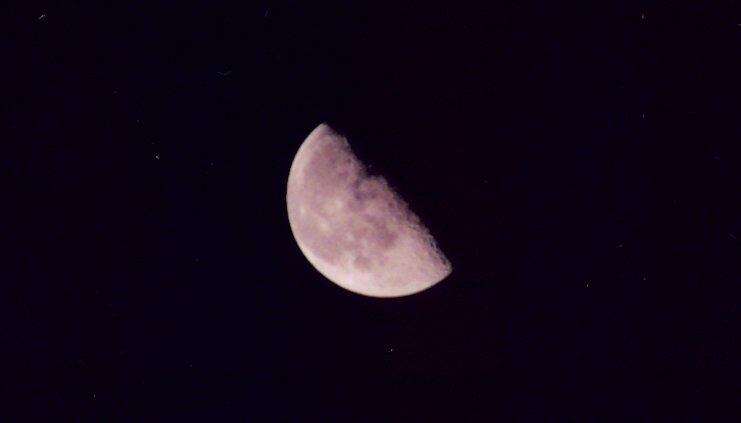 The Moon begins our week in its waning gibbous phase as it prepares to pass through third quarter on Wednesday, September 1, about the time of its noontime Moonset as seen from North America. We then see a bit of the waning crescent throughout the rest of our period. Having passed Jupiter last week, the quarter will reside north of Taurus's Hyades to the east of the Pleiades. With Jupiter opposite the "gang of three" (Saturn, Mars, and Venus ), there are no planetary passages to admire for a time. Speaking of which, the "gang" as such is pretty much gone into twilight, though brilliant and obvious Venus is still very much present. You have to catch it early, however, as it sets as twilight ends, around 9 PM Daylight Time, and even that is too late. The big event is the nifty pairing between Venus and the star Spica. 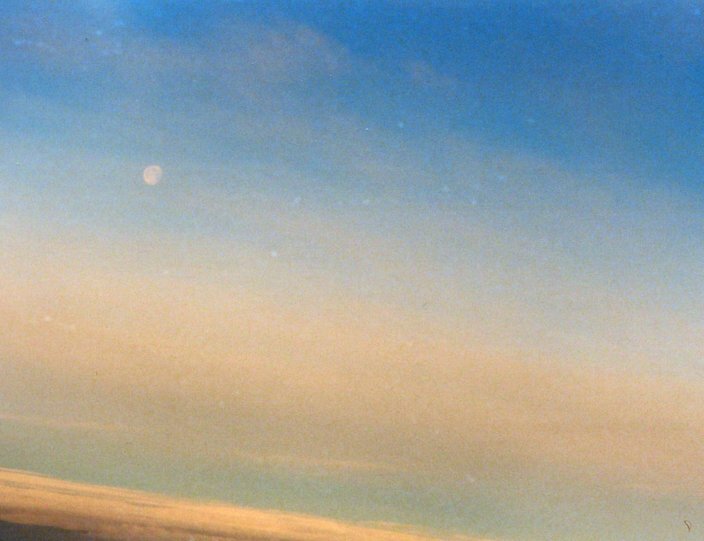 Watch as August turns to September to see Venus only a degree or so below the much fainter star (use binoculars), formal conjunction taking place on Wednesday the first just an hour after the Moon passes its formal third quarter (the events of course having nothing to do with each other). Notably fainter than Spica, Mars is up and to the right of Venus, the red planet passing the star early next week. Saturn is now effectively out of sight, though not quite as much as is Mercury, which passes inferior conjunction with the Sun (more or less between us and the Sun) on Friday the 3rd. But as has been the case for some time now, as the evening trio disappears below the horizon, very bright Jupiter rises due east, retrograding slowly westerly just southwest of the Vernal Equinox to the southeast of the Circlet of Pisces. Not quite at opposition to the Sun, the giant planet crosses the meridian to the south around 2:30 AM Daylight Time. With dawn coming ever later, early risers have a nice chance to see the bright planet just into the southwest as they go to school or work. 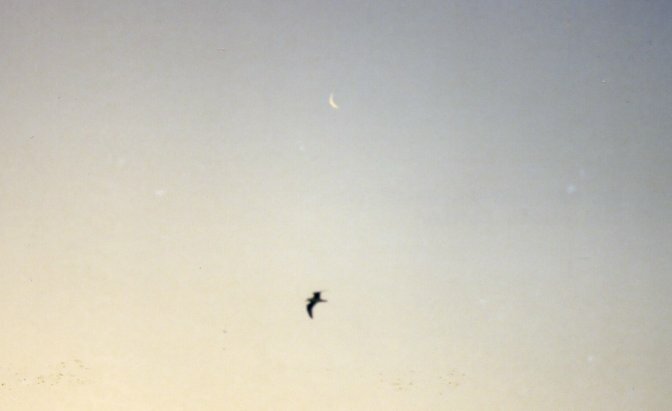 Two great birds fly the evening sky. To the east, look for the Northern Cross with Deneb at its top, the Cross making the central portion of Cygnus, the celestial Swan. To the south flies Aquila, the Eagle, with bright Altair, which along with Vega in Lyra make the Summer Triangle. One more bird, spring's Corvus, the Crow, comes down to us from ancient times. Several others are modern inventions. All in the southern hemisphere, they include rather prominent Grus (the Crane), which is visible from southern US latitudes in autumn. Much farther south strut Pavo (the Peacock) and Tucana (the Toucan), the latter holding our nearby satellite galaxy, the Small Magellanic Cloud. To these, add the mythological figures Apus, the Bird of Paradise, and that of the eponymous Phoenix, both lying within the southern hemisphere's domain.